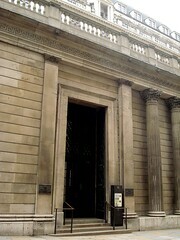 A museum covering the history of the Bank of England. It's located within the Bank itself, though the entrance is separate (on Bartholomew Street just off Threadneedle Street — Exit 2 at Bank Station is the most convenient). There's no entrance charge. Entry is into a lobby where a security check is performed and the visitor is provided with a helpful information booklet including a floor plan. The first room of the museum proper is a replica of the Bank's stock office as it stood at the end of the 18th century, reconstructed on the basis of original drawings by its architect, Sir John Soames. As well as counters, ledgers, and life-size figures of a banking clerk and a cat, this houses the museum's current special exhibition; in March 2010 this was The Pound In Your Pocket, a look at inflation with a hot-air balloon game as its centrepiece. Subsequent displays lead linearly through the museum, with a good mix of storyboards, films and interactive displays, and historical items including one of the earliest cheques still in existence, written out in longhand on the 8th of December 1660, and the earliest known banknote, again handwritten, from June 1697. The story of the Bank is told from its initial beginnings as a £1.2 million loan from a company of investors to the government, to help fund King William III's war efforts against Louis XIV of France — essentially, the creation of a permanent national debt. Other interesting aspects of our monetary system are covered too, with exhibits such as tally sticks and a set of copper printing plates used by the notorious forger William Badger. Note that the museum is popular with school groups, which can impede viewing to some extent; on Kake's March 2010 visit it was impossible to enter the rotunda (which houses the middle third of the intended progression through the exhibits) as it was full of (well-behaved) schoolchildren. Photography is not permitted. There's a security check (metal detector) at the entrance, but they don't mind you bringing bags in. Accessibility: Steps up to get in, and a few more steps inside. However, according to the access page on their website, there are portable ramps available, and if you call ahead they will set these up in advance. Last visited by Kake, March 2010. Opening hours taken from the Bank Of England Museum website, February 2019. Last edited 2019-02-05 18:16:22 (version 5; diff). List all versions. Page last edited 2019-02-05 18:16:22 (version 5).